Registration is open from January 20 – February 24, 2019. 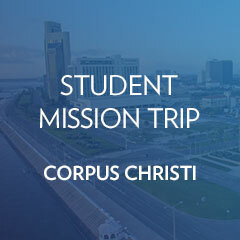 We will be partnering with local church partners in the Corpus Christi area to further their ministry in making disciples through block parties, personal evangelism, etc. In addition, we will partner with local ministries to serve the people and the community. Lodging will be in a local Corpus Christi hotel. Online registration is available thru February 3rd and can only accept a one-time payment in full or deposit. Registration closes and deposits are due before February 3rd. Additional payments will need to be made by check or credit card at trainings or in the Student Ministry office. If the participant does not meet the requirements the deposit/payment will be refunded. The requirements to be eligible to serve on one of our mission trips is detailed below. Training for our mission trips is an essential part of our mission trip planning. Not only does it prepare the student in the capacity for which they will be serving but it also emphasizes on team building which is a critical component for a successful mission trip team experience. At the March 3rd Parent Meeting a Parent/Student Commitment Form will be available for you to sign outlining the requirements of attending training. Missing more than two trainings can result in being dropped from the trip. Listed below are the training dates.